Did you know you can tag your contacts? Tagging your contacts makes it easy to filter them by different categories and easy to send a quick group message. Many of your contacts are automatically tagged when you connect, based on the invitation you sent. If you said they were a colleague in the invitation, they’ll be marked as such. But you can add tags too. You can create up to 200 unique tags. Do you want to quickly be able to see just your contacts who are recruiters? Or, people you know through a particular professional association? Create the tag, and then tag your contacts. Next to the word ‘Tags’ is the word ‘manage’. Click ‘manage’ and you’ll be able to add any tags you like. 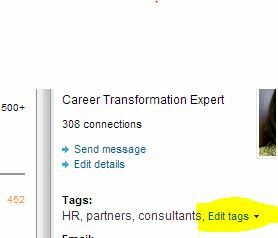 For example, I created an ‘HR’ tag, a ‘recruiters’ tag and a ‘consultants’ tag. If I want to make a referral, I can quickly scroll through them to find the right one to refer to. You have to mark each person with the tags you create. This can be a time consuming process, but worth it. To do this, click on a contact. Their details will show in the right hand column. Now, click on ‘edit tags’, mark the tags you like, and save. See below. As you accept new invitations, you’ll want to tag people right away. Trust me, it’s easier this way. Once you’ve tagged your contacts, when you click on that tag in the left hand column, you’ll see only the people with those tags. In the right hand column, you’ll see the words ‘Send message’. To send a group message, just click this. A new message window will pop up, pre-populated with their names. Now compose and send. That’s it! It may look a little complicated here, but after you’ve done it a time or two, you’ll find it easy. After a nice little summer break, I’m back. In my last post, I said I would next begin covering intermediate LinkedIn functions, so here goes! Would you like to connect with other like-minded professionals? No matter where they are located? Looking for contacts in a particular company? Looking to expand your knowledge? Would you like to become better known in your “niche”? There are many reasons to join LinkedIn groups. To a great extent, they mirror the reasons to join any group: to share or gather information, to meet people with common interests, to be part of something larger than yourself, to help others. The reasons go on and on. But there are over 900,000 groups on LinkedIn! How do you find the right ones? Groups are a great shortcut for networking and building your professional brand. Use the tips above to get started today! Even though LinkedIn is growing by leaps and bounds, I am still finding many professionals out there who are not on it, or are on it, but don’t really know how to use it. This has inspired me to write a series on LinkedIn – some tips and techniques you can use to make use of it professionally. LinkedIn won’t be my exclusive writing focus but I’ll sprinkle posts in throughout the remainder of the year that you may find helpful. have you ever left a job and later realized you can’t find the contact information of co-worker, vendor or client you’d like to get in contact with? have you ever wanted to get in contact with a co-worker, vendor or client who has left their company? would you like to stay up-to-date with your professional contacts, but aren’t the best at taking time for lunch or coffee with them? would you like to be able to reach out, on a moment’s notice, to a large number of professionals in your field to get information on new developments in your field, or get recommendations on resources? would you like to be able to find in-depth information on job titles, job descriptions and job locations within companies, not just what is posted on the job boards? would you like to be able to identify contacts within companies for networking, job search or marketing purposes? would you like to do more to control or enhance your professional brand? Okay, that’s more than a few questions. I think you get the idea. 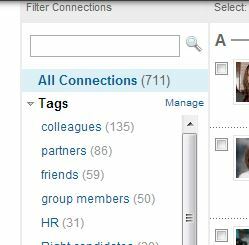 Not only is LinkedIn a great way to maintain control of your ‘Rolodex’ and maintain connections to your professional contacts, it is a gold mine of market intelligence. In the coming weeks, I’ll walk you through methods for achieving all of the above. Subscribe today to be notified by email of future posts, so you don’t miss these timely and practical tips. I look forward to helping you get LinkedIn! Okay, you’ve successfully entered a networking conversation. It’s going well. Hooray! Now it’s time to leave. 1. After the other person makes a statement or observation, resist the urge to say “Really?”, or just mumble “Mmhhh”. This is an inadvertent prod, and will cause them to continue talking. If you say anything like that, immediately jump into step 2. 2. Instead, let them know you have enjoyed the conversation and, if you have been listening well, you have probably identified an opportunity to follow up with them. Let them know you’d like to follow up, and get their assent. 4. Thank them and reference the next touchpoint you expect to have with them. Perhaps you have an article you are going to send them, or you will likely see them at the next meeting, or they have offered to connect with someone on your behalf. You: “Do you have a business card? Here’s mine. (Exchange cards) Thanks. Enjoy the speaker tognight.” (Walk away). As someone who used to be paralyzed at the thought of walking into a group of strangers, but now loves it, believe me when I say “you can do this”. Heck, you might even enjoy it someday. by Debra Fine. It is a short, extremely practical, how-to guide and the best bang for your buck out there. Now, get out there and put these tips and your natural strengths to work. Happy networking! But what if I asked you – do you like people? Most of you would say “yes”. However, if you are an introvert you can most likely be described as selectively social, in that you like to develop deeper relationships with fewer number of people than an extrovert would. Consider this: there are attributes common to introverts that can actually help them network effectively. 1. It may be mutually beneficial. You are not just asking or taking, you are giving too. You have more to offer than you think. 2. It is your responsibility to carry your share of the load. This means initiating conversation. If you make the other person do all the initiating, you are making them do the lion’s share of the work. And that’s not very gracious, is it? 3. Being nervous is about you, not them. I don’t remember where I heard this gem, but I absolutely love it and it has helped me tremendously over the years. Focusing on being nervous puts the emphasis on how you are feeling, not on how they are feeling. Magically, if you focus on them and putting them at ease, you will find yourself more at ease. 5. Select one of a few questions you have identified in advance as conversation starters – “Are you new to this group?” or “Have you been a member of this group long?” or “I believe Daniel Pope invited a number of new people to this event. Did he invite you?”, etc. Everyone at an event has chosen to be there for some reason. Focus on finding out why those you meet are there. This alone can lead to some very fruitful discussions. It will help you uncover common interests and perhaps even ways you can help them (here’s the mutually beneficial part). Now, a word about distance. If you are selectively social, you don’t want to become best friends with everyone you meet. And the good news is – you don’t have to. But you don’t have to ignore them either. There is an in-between ground. If you follow the steps above you will get there, more easily than you might have imagined. As a good networking conversation is brief, it will soon be time to exit the conversation (perhaps to your relief). We have already bitten off quite a bit today, so I’ll give you a chance to digest the above and I will address exiting in my next post.